Looking to embark on the road less traveled? This itinerary offers the perfect exploration of Peru's famous highlights, while discovering the hidden treasures and natural beauty, far from the crowds. Your adventure begins in the charming colonial town of Cusco, before spending three nights camping beneath the start in the Andes, as you follow the path of the Inca Quarry Trail. During this cultural trek, you will observe an astonishing variety of scenery and ecological zones, snow-capped peaks and archaeological remains. Upon arrival into Ollantaytambo, take the train to Km 104 and begin a full day of hiking on the famous Inca Trail! You will twist, turn and wind your way through the stunning cloud forest, finally ending with your descent into the majestic ruins of Machu Picchu. Spend the night in Machu Picchu Pueblo, before returning to further explore the ancient citadel the following morning. By the afternoon, you will board the return train to Cusco for the final evening of your adventure. 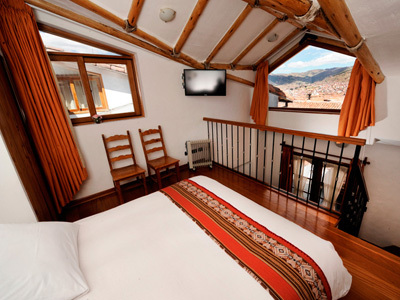 Enjoy this free day at your leisure in Cusco acclimating. This mountain town is a great opportunity to immerse in Peruvian culture, as there are many plazas and historical buildings to explore. You may want to enjoy a coffee on one of the balconies overlooking the Plaza de Armas, or wander through the streets of San Blas in the historical district. Bring your camera along to capture your discoveries of this beautiful city! At your hotel later this evening, your guide will hold a full trek briefing. You will be able ask your guide any questions you may have to help you prepare for your adventure ahead! At the meeting you will also be provided with a loaner duffle bag, which you may utilize to pack all items necessary for your trek (i.e. clothes, toiletries, shoes for the evenings, etc.). Your porter crew will be responsible for carrying this duffle, which you will have access to at the end of each trekking day. You will only be responsible for carrying your own individual day pack, which will hold items you wish to access throughout the day (i.e. rain poncho, camera, water bottle, etc.). *Please Note: You will be able to store your main luggage at your hotel in Cusco for the duration of the trek. Your adventure takes off from Cusco this morning, as you are driven to Pachar in the Sacred Valley of the Incas. From there, you will head off on your scenic expedition of the spectacular Inca Quarry Trail Trek! You will first follow the Huarocondo gorge a short way upstream, to the trail head located in the village of Raphcca (9,510 feet above sea level). Continue, with a hike up a lush side valley of scattered farmhouses and crop terraces, where Andean bird species, such as the giant hummingbird and golden-billed saltator flit among abundant native trees and shrubs. This afternoon you will stop to enjoy a picnic lunch by a rushing mountain stream, before deciding whether to take an easier route forward, or an optional steep trail via a tall waterfall, where you can enjoy a refreshing rest amidst the cool spray, or even indulge in an alfresco shower and dip beneath the falls! Climbing further, you will visit the little-known Inca ruin of Corimarca, perched at mid-altitude on a shelf high above the Soccma Valley. An Inca-built channel still carries water rushing past this small, elegantly designed settlement, which was probably built by the Incas to collect and control the agricultural production of the surrounding valley. You will set up camp here, or at a spacious set of Inca terraces, only a short distance up valley. This morning, enjoy a tasty breakfast at your camp site, before kicking off today's trek with a climb across open meadows. Eventually, you will reach a zone of high altitude shrub land, which in turn gives way to treeless grasslands, known as puna. It is here, that the trail starts to wind gently around mountain spurs, following an undulating approach to the pass of Chancachucu (14,430 feet). In clear weather, this section of your journey offers dramatic panoramas of every major snow peak in the region. You can gaze east, across the distant town of Chinchero, towards the mighty snow capped Ausangate and the Qoyllur Rit’i range, while the jagged peaks of the Cordillera Urubamba rear across the Sacred Valley to the north. The scenic drama reaches new heights, as you cross the pass and confront the glaciers of Verónica (18,850 feet), looming vastly in the near distance to the north west. From there, your route continues across a rolling, sparsely inhabited plateau with views of the tip of Salcantay and the Huayanays. You will pass mountain lakes where you may see wetland birds, such as Andean geese, crested ducks and puna ibis, before descending into your second camp at Q’euñacancha (13,380 feet). You will settle in there, for dinner and another star filled mountain night. Today is your third day on the trail and with luck, you may even spot an Andean Condor! After breakfast at your campsite, you will set off on one of two routes. Fitter, more experienced groups will proceed on the Chancachucu Valley downstream, following the broken remains of an Inca water channel that once carried water to the ancient quarries. The stream plunges through Punkuyoc, a narrow ravine enclosed by vertical cliffs draped in ferns and orchids, and emerges amidst a small wood of native Q’euña trees. A narrow trail zig-zags down grassy slopes, featuring spectacular aerial views of the Camicancha Valley and its scenic river. You will climb to pick up the Inca water channel above you, from where a more leisurely path leads you to beautiful views of Ollantaytambo and the Sacred Valley. Here, you will reach the imposing gateway of Intipunku, an Inca temple dedicated to the worship of snow capped Verónica. The alternative option and easier route for today, features a gentle climb from the second camp, across rolling grassland to the south flank of Yana Orco. This is a rocky crag, high above the Sacred Valley and the Inca quarries. From this fascinating viewpoint, you can look straight down on Ollantaytambo and its valleys, as if you were in an airplane. Continue winding your way along the rim of the valley, until you have reached a pass, where you descend through steep native Q’euna woodland, en route the Inca site of Intipunku. This afternoon, you will stop to enjoy lunch at a picture perfect spot near the well-preserved Inca complex of Choquetacarpo. This site was most likely the residence of architects, masons and visiting dignitaries, who managed the Inca quarries and performed ceremonies at Intipunku. Afterwards, you will wind your way down different sectors of the Inca quarries and a natural rockfall, where massive carved blocks of pink rhyolite are scattered. The quarried stones, testimony to a great building project that was never finished, were destined for the Inca temple at Ollantaytambo. 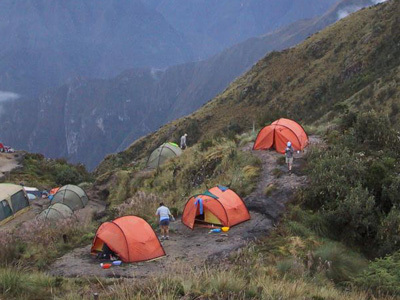 At last, you will descend to your third and final camp, located on Inca terraces topped by small burial towers, known as "chullpas", near the village of Cachicata. Here, you can enjoy the luxury of toilets, hot showers and a warmer climate, as you relax in preparation for your unforgettable visit to Machu Picchu tomorrow morning! Following breakfast bright and early this morning, you will be transferred to the Ollantaytambo Train Station in good time to board the Vistadome train along the Urubamba River to KM 104 of the railroad. Upon arrival at KM 104 of the railroad, you will disembark the train and continue your journey on foot. Your Short Inca Trail adventure begins at the Inca site of Chachabamba. After a brief exploration of this lovely ruin and its water channels and fountains, you will embark on a four hour ascent. This area features breathtaking aerial views of the great valley and a cascading waterfall near the site of Wiñay Wayna (Forever Young). Make your way through one of the largest and most exquisite sites along the Inca Trail, admiring its chain of ritual baths and elegantly curved terracing, before meeting up with the main Inca Trail. Wind your way across a steep mountainside and up narrow stairways, through lush, humid cloud forest of giant ferns and broad leaf vegetation. Suddenly, you will cross the stone threshold of Intipunku (Sun Gate), to encounter an unforgettable sweep of natural beauty and human artistry – a backdrop of twisting gorges and forested peaks framing the magical ancient citadel of Machu Picchu. You will walk the last half hour down the royal flagstone walkway, past outlying shrines and buildings, through the heart of Machu Picchu. Even this first glimpse will leave you captivated. Outside the ruins, you will board a short shuttle bus to the town of Machu Picchu Pueblo, where you will spend the night and enjoy dinner at your hotel property. Enjoy an early morning visit to the fabled ruins, spending today in both guided and individual exploration. Make the most of this opportunity to visit the most fascinating features of this astounding and mysterious Inca settlement. Take your time to discover and investigate the multitude of hidden nooks and corners. If you're itching for a challenge, you may be interested in embarking on the grueling trek up to the summit of Huayna Picchu. Facing steep and exposed steps, this journey is not for the fainthearted, but offers an astounding "condor's eye" view above the ruins. Please note that this trek requires a special Huayna Picchu Permit, which has not yet been included in your tour. Should you be interested in this expedition for an additional cost, please let us know as soon as possible, as permits do sell out. After an overwhelming adventure of this glorious monument to the Inca achievement, a delicious lunch will be served at the famed Machu Picchu Sanctuary Lodge. Following lunch, you will take the shuttle bus back down to Machu Picchu Pueblo, where you will board the Vistadome train for the return trip to Cusco. Upon arrival at the Poroy Station, which is located just outside of the city, you will be greeted by your driver and driven directly to your hotel in Cusco. Fall asleep this evening, reminiscing on your unforgettable adventure through the Andes! We hope you had an incredible trip and we wish you safe and pleasant travels onward! There is no where more epic to spend the night, than tucked in between the dramatic Peruvian Andes, covered by a majestic blanket of stars. Enjoy the convenience, comfort and assistance of local porters and cooks, who will quickly become friends, as you trek through the impressive mountain scenery. The porters will carry all of your luggage, so you only need to worry about your day pack and making the most of this experience. Each evening, the tents will be assembled for you and delicious meals will be freshly prepared. The tents are sturdy and can fit up to two people. Each morning, you can wake up to the sweet smell of breakfast, accompanied by a heavenly panoramic view of the mountains. This is just one of many authentic travel experiences offered by Global Basecamps. If you are interested in more unique destinations to Peru with unprecedented planning and extraordinary service visit our main Inca Trail tours page to browse other sample trips.